Choosing the best type of sunscreen can be challenging because there are so many options available. The good news is that lotions, sprays and sticks can all protect you from the harmful effects of the sun’s ultraviolet (UV) rays. 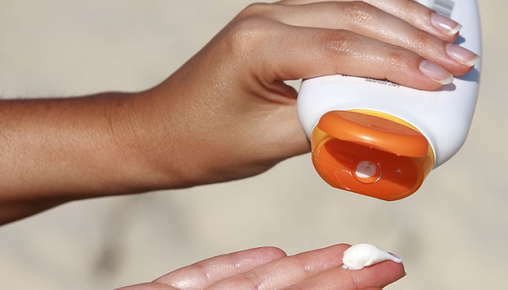 To get you headed in the right direction, here is a quick guide on decoding sunscreens. If you have ever used a sunscreen, you are probably familiar with the term SPF, which stands for “sun protection factor.” This number, which is found on all reputable sunscreens, gives an indication of how much protection a sunscreen provides against sunburns. A SPF of 15 means that you can stay in the sun 15 times longer before getting a sunburn. So if you usually burn in 30 minutes without sunscreen, you could stay in the sun for 7.5 hours. This, of course, works only if the sunscreen doesn’t wash off with swimming, bathing or other activities. Products with an SPF over 50, though, may not offer that much added protection. So look for a sunscreen with an SPF between 30 and 50. These will provide you with adequate sunburn protection. Also, SPF only reflects how much protection the sunscreen provides against UVB rays that cause sunburn, but not against UVA rays. For better overall protection, look for a sunscreen that offers “broad spectrum” protection against both types of UV rays. Lotions, creams, milks and oils tend to be more hydrating, which is good if you have dry skin. They are also easier to apply in sufficient amounts over large areas of the body. Sunscreen sticks are often drier and can be used in areas like around the eyes. These products often contain wax or petrolatum, which makes them less likely to wear off in the water. Spray sunscreens are easy to apply, especially in hairy areas such as your neckline or on a man’s chest. If you are not careful with sprays, though, you may not apply enough sunscreen, which will leave your skin exposed. Also, be careful not to inhale the spray. Apply the sunscreen 15 to 30 minutes before you go outside. Apply enough sunscreen to cover your exposed skin. For sprays, apply and rub in, then repeat. Reapply the sunscreen every 2 hours and after sweating or swimming. Although sunscreens can protect you from sunburn, they may not protect you from other types of damage caused by the sun’s ultraviolet rays. This includes damage to the skin cells and their DNA, faster aging of your skin and skin cancer. Wear clothes. These can reduce your exposure to the sun’s UV rays. Hang out in the shade. Look for a shady spot underneath a tree or a moveable canopy, especially when you will be outside for several hours. Protect your eyes. Sunglasses can protect your eyes from UV radiation the way sunscreen protects your skin. Avoid sunburns. If your skin becomes red or blistered after being in the sun, you’ve been out for too long. Check the UV Index. This will help you plan your outdoor activities. If the UV Index is high, plan accordingly. If you still have questions about which sunscreen is best for your skin type or lifestyle, ask your skin care professional.